Steinmann Mennonite Church partnered with the Foxboro Green and Stonecroft communities to sponsor two Syrian families. One family of six arrived in February 2017 and one family of three arrived in July 2017. The families have settled in well and are building strong connections in our local community. They are immensely grateful for a safe and secure home and the opportunity to see a bright future for their children. These sponsorship contracts officially ended after a year. However, wonderful friendships and informal support continue. We thank God for the the joy we have received by answering the call to welcome these newcomers into our community. 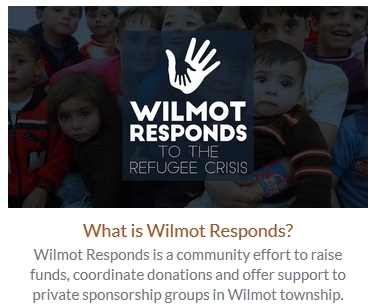 If you are interested in helping yet another family resettle in Wilmot, please contact the church or Mennonite Central Committee at https://mcccanada.ca/refugee-sponsorship-frequently-asked-questions. Currently, there are fewer countries opening their doors to refugees in need of resettlement and Canada has a unique opportunity to respond through the blended government and private sponsorship (BVOR) Program.